Safety is our first priority when working with drones and we operate within a clear set of guidelines defined by the CAA. The following Q&As are ones we’re frequently asked and provides useful information, but if you have any others or require specific information then feel free to call us on 07798 500 572 or use our contact page. Yes. Aerialview has £2 million public liability insurance (which can be increased if required on request). All of our pilots are fully licensed and have passed the CAA-approved exams and ﬂight assessments. They all hold the established industry Remote Pilot Qualiﬁcation (RPQ-s) for multi-rotor aircraft under 7kg. 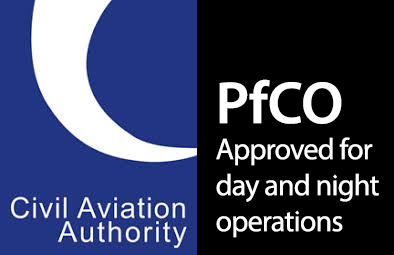 Aerialview has a current PfCO (“Permission for Commercial Operations”) granted by the C.A.A (Civil Aviation Authority). Our extended permissions allow us to operate within congested areas as well as during night hours. We are happy to supply a copy of our PfCO and insurance documents on request. A valid PfCO is mandatory for anyone flying drones for commercial use in the UK and needs to be renewed every 12 months. CAA Regulations & UK law states that we are unable to fly more than 500 metres away from the operator – this gives us a 1km flying zone. To give greater flexibility, we are able to fly from the back of a moving vehicle. We are legally required to fly below 400ft/120m, however, with special permissions from the CAA this may be increased should you feel it necessary. A typical flight lasts for around 10-25 minutes depending on drone & camera load before the batteries need to be changed. We do however carry lots batteries and charging systems so we can achieve continuous flight. Can you fly in the wind? Yes, within reason. Our drones will operate safely in up to 25mph winds but gaining a stable image is hard if the wind exceeds 20mph regularly. Yes, but we would need to discuss the brief to ensure the space is big enough for the drone to operate safely. We use a range of drones which can carry various camera payloads depending on the requirements of the task. Typically we shoot with an DJI Inspire drone and X5 gimbal with a range of interchangeable lens. Can I see what you’re filming during the flight? Yes. We have a live HD video stream down to the ground so you can see exactly what we are filming. We use large DJI CrystalSky monitors so the image is bright and clear to see, even in bright sunlight! We can also broadcast a live stream of the footage over the internet for remote monitoring. If we both decide to stay with the day and we have bad weather, our pilots will wait on site as long as possible in the hope of a break in the weather. Should we have to re-schedule a date because of weather the booking deposit is transferred to the new date. Weather is known business risk in the UK so we are as flexible as possible to ensure that bookings can be rearranged. Can you fly & repeat complicated flight patterns? Yes. We can plan flights using waypoints which enable use to fly very precise predetermined flight patterns for specific commercial applications. For example for agriculture flying over a 40-acre field, we can preset a horizontal pattern with a 75% overlap on each pass and then repeat the task following the same flight path at a later date.